One could safely say that James O. Wing had been “playing hard ball” most of his life – from American Legion Baseball while attending Tucson High School (class of 1954) to becoming Association Head Baseball Coach at the University of Arizona. Jim spent five years playing the semi-pro circuit, coached at Tucson and Palo Verde high schools and was coach of the Peoria Pacers of the Central Illinois Collegiate League. 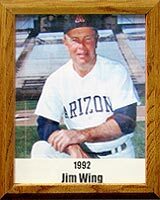 During his splendid career, Jim has accumulated some impressive honors, including being named 1965 Coach of the Year (Tucson) and 1969 Arizona High School All-Star Coach, as well as serving as baseball instructor for Pros in Action Sports Clinic and Wildcat Baseball Camp. He has conducted baseball clinics for players and coaches in six states in the U.S. and in Germany, Holland, Italy, Taiwan and China. During his stint as Associate Head Baseball Coach at UA, Jim participated in 767 wins, including three NCAA championships and four Southern Division Pac-10 titles. He has coached six All-Americans and has seen 45 of his pitchers and 16 catchers sign professional contracts. Jim is the 1992 recipient of the Tucson Conquistadores’ Lifetime Achievement Award.